Mamma loves a beach playground and this one can't get much closer to the bright blue water of the bay. 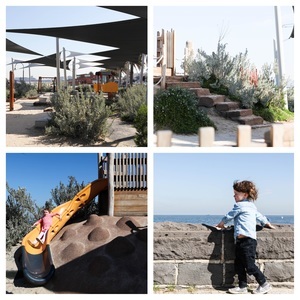 With hidey holes and climbing ropes, swings and slides and swirly things amongst the gorgeous beachy greenery - you'll feel a bit like you're on holidays! The park is fenced so no one can make a fast escape, and just look at those lounges looking out onto the water...devine. Mamma's special mention: The South Melbourne Life Saving Club is about 100 meters away and it's cafe Dollies serves wraps, toasties, hot dogs, drinks etc. if you feel like a spot of lunch and it also has the closest public toilets. If you want to continue playing - Play Central is only 5 minutes away!